Dr. Gehardt G. Shurig has traveled a long and winding road on his path to becoming dean of Virginia-Maryland Regional College of Veterinary Medicine–from his birth in Santiago, Chile, to a stint as a meat inspector in a slaughterhouse, to academic experience on opposite ends of the continent . It's due to his colorful background, and that long road he traveled, that VeterinaryPracticeNews.com chose to launch our Vet School Dean Q&A series with Schurig. At the time I joined veterinary medicine, there was much talk about the need to feed the world. I was interested in improving farm animal health and productivity and also had great interest in studying diseases that spread from animals to humans (zoonosis). I wanted to contribute to the discovery of new ways to eliminate or control such diseases. I had three simultaneous jobs. Very early in the morning, I worked as a meat inspector at a small slaughterhouse. I had a day job as an instructor in physiology at a university and a night job (starting at 9 p.m. until 5 a.m.) as an emergency clinician at a small animal practice. I received a research assistantship from Cornell University and worked toward a PhD in immunology and pathogenic bacteriology to further pursue my interest in research and prevention of infectious diseases. I read a variety of newsletters, publications and blogs from associations such as the AVMA and AAVMC. Additionally, at our college, we have a dedicated team of people who evaluate and analyze current events and their potential impact on VMRCVM and distribute the information internally. Our college seeks to matriculate a diverse group of academically exceptional students whose attributes and accomplishments suggest they will be competent professionals, life-long learners, future leaders, and scholars in veterinary medicine. Many discussions are taking place to help find a solution to this escalating problem. It is not easy since veterinary education is an expensive undertaking and state support for higher education and, consequently, for veterinary medicine is decreasing throughout much of the United States. We have been actively collaborating with AAVMC and other organizations to address this problem and work with federal agencies, such as USDA, to promote programs that may repay some of the loan debt for participants. Increasing class size allows for the costs to be spread among a larger number of students. It can also reduce or slow down tuition increases to somewhat mitigate the problem, but this is only a partial solution. We do. The VMRCVM curriculum offers students the opportunity to select species-based tracks to enhance skills in specific areas. To that end, two of our college’s five tracks (food animal and mixed or multi-species) provide students with additional skills to work in these rural practices. We presently have stable-to-increasing numbers of students selecting the food animal and mixed career options. We work to provide awareness through TV, print, and web media about the shortage and importance of working in these fields. Additionally, VMRCVM works diligently to keep students aware of rural externship opportunities available from multiple organizations, including the Virginia Academy of Food Animal Practitioners, the American Association of Bovine Practitioners, the Academy of Rural Veterinarians, the Academy of Veterinary Consultants and Pfizer Animal Health – Bovine Externships. Our curriculum and programs are continuously reviewed and adapted to new realities and evolving into the directions that society demands from the profession. In the fall, we launched a Master of Public Health program in collaboration with the Virginia Tech Carillion School of Medicine. The 42-credit professional degree program, which offers concentrations in public health education and infectious disease, integrates and significantly expands public health opportunities at the university. We also continue to expand our research programs. Earlier this year, for example, we launched the Center for Veterinary Regenerative Medicine in a partnership with Wake Forest University's Institute for Regenerative Medicine. We will continue to evaluate what new programs can help prepare veterinarians for the demands of animal and human health and society, as a whole. VMRCVM has made considerable breakthroughs in our research in autoimmune diseases. In an effort to better understand epigenetic factors in the causes of lupus, for example, our researchers had great success in studying microRNA (miRNA), and seeking to determine potential impairments of genetic regulation. We have also had considerable success in the area of vaccine development. Researchers at our college developed a vaccine to protect against type 2 porcine circovirus infection and Post-weaning Multi-systemic Wasting Syndrome in pigs, a major threat to the global swine industry. Importantly, we developed the RB51 Brucellosis vaccine, which was important in the eradication of bovine Brucellosis in the United States. There is a strong sense of community here that I believe is unmatched in any other college. Additionally, as dean of the Virginia-Maryland Regional College of Veterinary Medicine, one of the things that I've always been most proud of is the collective outlook and dedication of our college in staying ahead of the changing needs of the world. Our college has never sat idly and enjoyed the calm waters of stasis. Instead, we constantly ask ourselves questions, such as "How can we improve?" "How can we grow?" and "How can we anticipate new demands on a mature profession?" It’s exciting to be a part of an institution that is constantly changing, growing, and improving. Dr. Gerhardt Schurig was appointed the third dean in the history of the Virginia-Maryland Regional College of Veterinary Medicine in June 2004. Prior to his present position, Schurig served as Associate Dean for Research and Graduate Studies, as Director of Virginia Tech's new Institute for Biomedical and Public Health Sciences (IBPHS), and as a senior researcher and former director of the Center for Molecular Medicine and Infectious Diseases (CMMID). Schurig, a professor and veterinary immunologist in the Department of Biomedical Sciences and Pathobiology (DBSP) who joined the faculty in 1978, is internationally renowned for his work in developing vaccines against bovine brucellosis, a zoonotic disease that causes reproductive problems in cattle and undulant fever in humans. 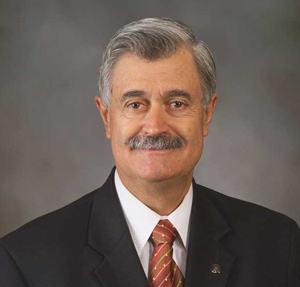 Schurig earned his DVM degree in 1970 from the University of Chile. After earning M.S. and Ph.D. degrees in immunology from Cornell University, Schurig spent two years working in the Department of Veterinary Science at the University of Wisconsin at Madison. He then joined the Virginia Tech faculty and began a research career in brucellosis that culminated with the invention of the RB-51 vaccine. That vaccine has become the global "gold standard" in bovine brucellosis control and played a major role in the virtual eradication of the cattle disease in the United States. Bovine brucellosis, a bacterial disorder caused by the Brucella abortus organism, is largely controlled in the United States and western Europe, yet it remains a significant threat in Africa, the Middle East, Central and South America and other developing areas of the world. Schurig has also been working on an almost $500,000 project with the United States Army Medical Research and Development Command to develop a vaccine which will protect people from brucellosis. Schurig currently leads the college's international programs and is director of the college's World Health Organization Collaborating Center for Veterinary Education in Management and Public Health. He served as head of the college's Department of Veterinary Biosciences in the mid-1980's before helping create and assuming leadership for the CMMID in 1987. During his seven-year tenure as head of that center, it established itself as a major research and development center focused on creating vaccines and improved diagnostic tests for several economically significant animal diseases. Schurig is a member of numerous professional societies, including the American Association for the Advancement of Science, the American Association of Veterinary Immunologists, and the American Society for Microbiology. He has received several major teaching and research awards, including the 1986 Beecham Award for Research Excellence.